The Complex of Koguryo Tombs represent the Koguryo Kingdom, one of the strongest kingdoms in the north east of China and the Korean Peninsula between the 5th and 7th centuries AD. 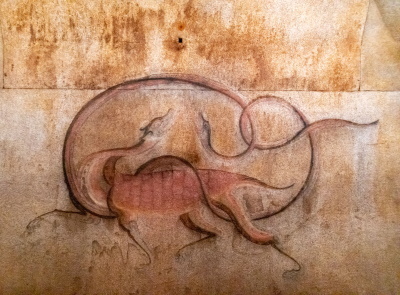 The tombs are designated a WHS because of the burial customs they represent and their beautiful wall paintings. I got to see the tomb of King Tongmyoung as well as part of my tour. The local guide at the tomb itself, and of course everyone needs to have a local guide at every place visited, was a lady highly knowledgeable in Koguryo history. I did enjoy listening to her. However, as expected, the history told to me was tinged with political undertones. After I had mentioned the name of Tongmyoung's son, which of course I had learnt from a South Korean epic drama serial on the king, the local guide surmised that I must have learnt about the name from sources based on the Samguk Sagi. The DPRK knows the son by a slightly different name. The Samguk Sagi is a history chronicle compiled during the Koryo period. The team that was responsible for it was unfortunately headed by a descendant of Silla royalty. The DPRK appears to think that the Samguk Sagi was written to belittle Koguryo and lift Silla's reputation. As further evidence of this belittlement, the local guide pointed out that the Samguk Sagi only lists 12 Koguryo kings when there were in fact, as believed in the DPRK, 17. By the way, Silla as we know was a southern kingdom and Koguryo was a northern one. Koguryo appears to be very important to the DPRK and indeed they say that this kingdom was the strongest Korean one ever to have existed. I suppose it was an attractive bit of history too since Pyongyang was a capital of Koguryo. As for the tomb itself, it was quite massive as compared to other Korean royal tombs, although really new. The temple nearby made for a nice visit. I had thought that I would get to visit the Kangso Three Tombs too but the itinerary I received was different from the one that the guides had. I was initially somewhat disappointed by this until I learnt from a guide that entering the tomb to see the wall paintings inside would have cost me 100 euros. She said that the paintings were worth every penny. I however believe that almost nothing is worth 100 euros just for a look. Before my agent would transport us to North Korea (DPRK) we had to sign that we would not publish any articles about the visit – I hope this review of the Koguryo tombs doesn’t violate that commitment! If you go to DPRK as part of a group you are likely to have to work hard to get to see this WHS - there is no freedom to go where you like and, unless you go on business, the alternative of a "personal tour" is likely to be very costly in what is at the best of times an expensive destination. The Inscription covers 12 different sites in various parts of the country and I identified 3 of them as possible "nearby targets" during our visit- 2 near the port of Nampho and 1, the Tomb of King Tongmyung, about 25kms outside Pyonyang. Unfortunately the North Koreans seem to favour taking tourists to tombs other than those chosen for WHS inscription! The favourite tomb for visiting in Pyongyang is that of King Tangun – the legendary (mythical?) ancestor of the Korean people from around 2300BCE. When his remains were “miraculously” discovered in the early 1990s even Kim Il Sung is reported to have asked Kim Jong Il if it was true! It is certainly a fact that the DPRK seems regularly to discover a lot of historical (particularly "Revolutionary")remains which could be regarded as supporting its “world view”. Another favourite tomb for visiting is that of King Kongmin near the DMZ at Kaesong. This dates from around 1352CE and belongs to a monarch of the Koryo dynasty which ruled all of Korea from the capital at Kaeson between around 930 and 1380 CE. It was a delightful site to visit and may be included in the DPRK Tentative list entry of “Historical Remains in Kaesong” (though that could just the rather attractive “old town”). In fact we did manage to get to the Tomb of King Tongmyung. I was perhaps lucky that our visit coincided with the 60th anniversary of the founding of the ruling “Workers Party of Korea” and there was a BIG morning parade in the city to which foreigners were NOT invited. So the opportunity to take us 25kms outside town for the morning might have seen particularly attractive – or maybe my "special request" to see the tomb was genuinely acted upon! The tomb is heavily reconstructed (this is even commented upon in the UNESCO evaluation). It (possibly?) dates from around 400CE The surrounding buildings and line of statues are completely modern but, in the depths of the renovated tumulus (photo), there does presumably lie an original burial chamber – the booklet for the site contains photos of it and the faint murals for which the Koguryo tombs are famous but which one cannot go in to see (Copies on paper are on show in the Art Gallery in Kim Il Sung Square together with a model of a tomb but no photos were allowed - though they were in the many rooms containing paintings of the “Great” and “Dear” Leaders!). Around the site in the pine forests lie a number of smaller unreconstructed tumuli of Generals and Princesses. So why has this group of tombs been chosen? The politics of this WHS is perhaps one of its most interesting aspects. Presumably the authenticity of the Tangun tomb would have caused problems even to the UNESCO advisors. The Koguryo Kingdom was one of 3 kingdoms which vied with each other in the Korean peninsular from 4th to 9th centuries The others were Silla and Paekche, both of whose heartlands are in what is now South Korea (Kjongju, the Silla capital, is a S Korean WHS). Koguryo’s boundaries stretched way into what are now China’s NE provinces as well as south towards Seoul (No wonder China would insist that its Koguryo sites were separately inscribed!). Its warriers were of legendary fierceness. Its capital was at Pyongyang. Emphasis on the superiority of Koguryo over Silla mirrors the same argument for the superiority of North over South. I quote from the site booklet “Koguryo .. defeated … aggressors on more than 20 occasions thus defending her dignity and laying the foundations for the establishment of a unified state in our country”. The people of Koguryo “praised the exploits of King Kongmyun for founding their powerful state and worshipped him, built a tomb for him and took good care of it”. Could this be an echo of Kim Il Sung’s magnificent tomb just a few kms away (which is perhaps the most amazing site in DPRK)? At the tomb a newly inscribed stone states in Korean and English “This site was registered as the World Cultural Heritage in Juche 93”. In DPRK the calendar commences in the year of Kim Il Sung’s birth (1912 - There was no year zero!) and is named after his self reliance philosophy - so the site was inscribed in 2004. Our next visit was to the exhibition of Kimilsungia and Kimjongilia flowers – species named after the “Great” and “Dear” Leaders respectively. Everything on display in DPRK is richly imbued with political meaning – The Koguryo tombs do not escape! Dragon: The mythical blue dragon is often depicted on tomb murals. Recommended for combination by AB: With Koguryo Kingdom (China): Both were requested by AB AND WHC to consider combining later - "Encourages the Chinese authorities and the authorities of the Democratic People's Republic of Korea to consider the possibility of a future joint, transboundary nomination of the Koguryan culture." 28 Community Members have visited.